How do I sync GoCo with my company calendar? If your account has the Manage Time Off permission, you'll be able to access Calendar page on GoCo. Your company's GoCo administrator can assign permissions. 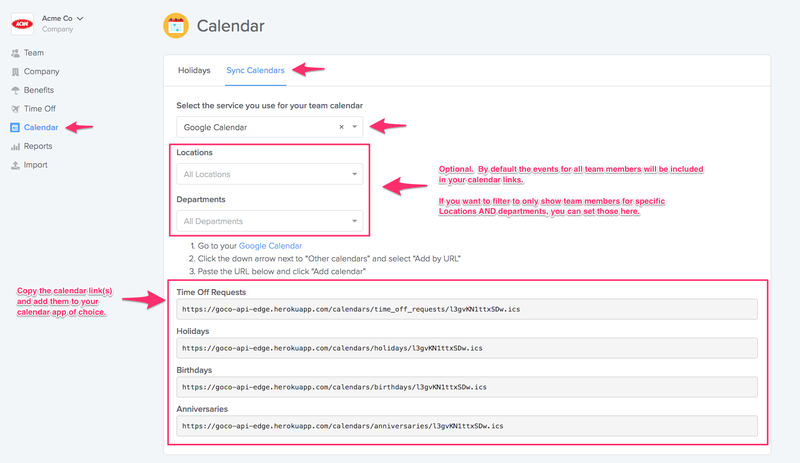 (optional) Choose Locations AND Departments to filter your calendar links to only show team members with a specific location and department. By default, GoCo will include the events for all team members. For example, if you want your calendar link to only include team members working at the Houston Office work location, AND the Sales department, select "Houston Office" work location and "Sales" for department. If you want to include multiple locations within the same calendar link, just select all the locations you want to include. The same applies with departments (just select all the departments you want to include). * Please ensure that any calendar links you send must be copied directly from GoCo and end strictly in .ics. If anything is added after the .ics file type indicator or are copied out of Google, it will generate an error when attempting to sync to another calendar.